In a country where the average man has a Ford Focus, the police need a Ford Focus to catch him. 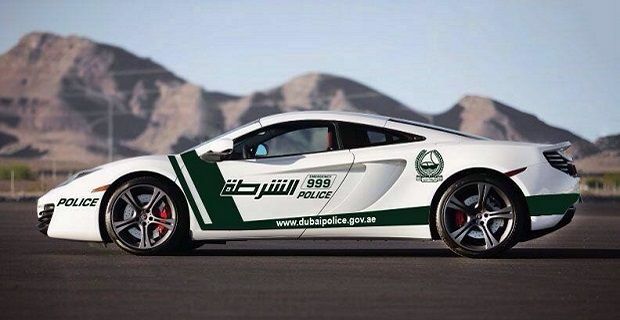 It makes sense that in Dubai where you’ll see more Ferraris, Porsches and Lamborghinis than Fords, the police need something quick to catch the criminals, so adding a McLaren 12C to the Dubai Police Force’s fleet of patrol cars isn't just sensible it's necessary. The Middle-East’s most glamorous police force has been known to buy some of the world’s most exotic supercars. Over the years they’ve used Porsche 911s and a Lamborghini Aventador. According to a report on Sky News earlier in the year, 15% of all traffic fines in Dubai are for speeds in excess of 130mph, so perhaps there’s a need for the new McLaren. The Dubai Police used their official twitter feed to announce the new arrival which will be parked next to a Mercedes SLS AMG, a Lamborghini Aventador, a Bentley and a 700bhp Brabus G-Class in the police force’s parking lot. It won’t be the quickest thing in their fleet but it’ll be swift enough. The 3.8 litre V8 powered car produces 592 bhp which is good for a 0-62mph time of 2.9 seconds and a top speed of 207mph. When the driver needs to stop, the McLaren goes from 62mph to a standstill in less than 30 metres and it can be stopped from 124mph in under 5 seconds. Dubai isn’t the only police force to have exotic cars but they’re the ones who like to shout loudly about it. The New York Police Department have a handful of Hummers which they use to disburse mobs, the German police forces use modified BMW 5-Series and Italian law enforcers can call on a Lamborghini Gallardo LP560-4 Polizia special edition machine that was produced for the police force.